Scientists still aren't sure what to make of Vesta, a small body that orbits the sun. Is it an asteroid or a planet? NASA's Dawn spacecraft could settle the matter. Vesta was spotted 200 years ago and is officially a "minor planet" — a body that orbits the sun but is not a proper planet or comet. Yet, many astronomers call Vesta an asteroid because it lies in the main asteroid belt between Mars and Jupiter. "I don't think Vesta should be called an asteroid," said Tom McCord, a Dawn team member at the Bear Fight Institute in Winthrop, Wash. "Not only is Vesta so much larger, but it's an evolved object, unlike most things we call asteroids." Bu calling Vesta a 'minor planet' is not distinctive enough, since there are more than 540,000 minor planets in our solar system. Dwarf planets — which include Ceres, the second destination of NASA's Dawn mission — are another category, but Vesta doesn't qualify as one of those. For one thing, Vesta isn't quite large enough to be considered a dwarf planet. "This gritty little protoplanet has survived bombardment in the asteroid belt for over 4.5 billion years, making its surface possibly the oldest planetary surface in the solar system," said Christopher Russell, a Dawn team member, based at UCLA. "Studying Vesta will enable us to write a much better history of the solar system's turbulent youth." 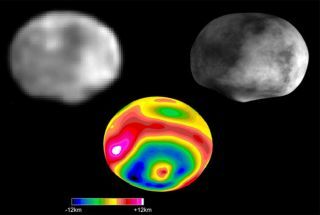 Dawn's scientists and engineers have designed a master plan to investigate Vesta's special features. The way scientists have designed Dawn's orbit will also allow the spacecraft to map new terrain as the seasons progress during its 12-month visit. The spacecraft will take many measurements, including high-resolution data of Vesta's surface composition, topography and texture. Dawn will also measure the tug of Vesta's gravity to learn more about its internal structure. "Dawn's ion thrusters are gently carrying us toward Vesta, and the spacecraft is getting ready for its big year of exploration," said Marc Rayman, Dawn's chief engineer at NASA's Jet Propulsion Laboratory in Pasadena, Calif. "We have designed our mission to get the most out of this opportunity to reveal the exciting secrets of this uncharted, exotic world."